The Clark turret truck’s 180º pivoting carriage makes it a versatile, cost effective truck that can be used in a variety of applications. You can work on either side of a tight narrow aisle or carry a wide load sideways through a doorway or in an aisle. This lift truck is available on two different base trucks in the Clark line: ECX 30 electric forklift and the C30C LPG forklift. The unique 180º pivoting carriage can pick or place a 48-inch-long load in a 72-inch unguided aisle on either side of the truck, which allows for lower cycle times and more efficiency. The compound and traverse sideshift allows for greater lateral movement in the aisle, reducing truck front end width. Clark I-Beam style nested rails are stiffer for side-loading due to larger symmetrical sections. Four external side thrust carriage rollers limit deflection. The adjustable flow control simplify set-up and reduce heat to the hydraulics system, preventing wear down and maintenance. The ECX30 electric and C30C LPG forklifts are ideal choices for demanding manufacturing and distribution applications. The option between an electric or LPG truck depends on the customer’s preference and needs. The Clark turret truck is available for sale or lease. 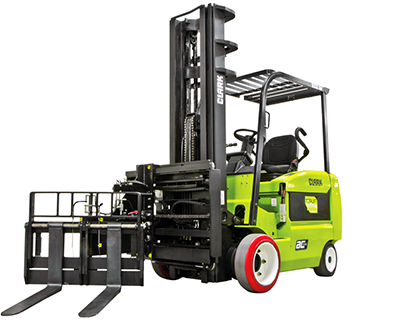 Contact a Forklifts of Toledo Sales Representative for pricing and additional information.